NaviGate Web Server is mainly a platform for developing and operation of map applications. Particular applications are usually customized based on requirements on function and graphical design. Special application for Vodafone Czech Republic a.s.
hybrid applications (combination of desktop and web applications. For more information on possibility of operating your applications on servers of Position s.r.o. click here. Installation on customer server(s) and remote administration by Position s.r.o. experts through VPN and Remote Desktop. Integration example of NGWS and desktop application “System of commercial information” (SOI) of DDM Group companies (Metrostav, Doprastav, Subterra). Possibility of visualization of spot, line and surface objects, their editing and visualization in browser environment with close linkage to SOI (Oracle) application. 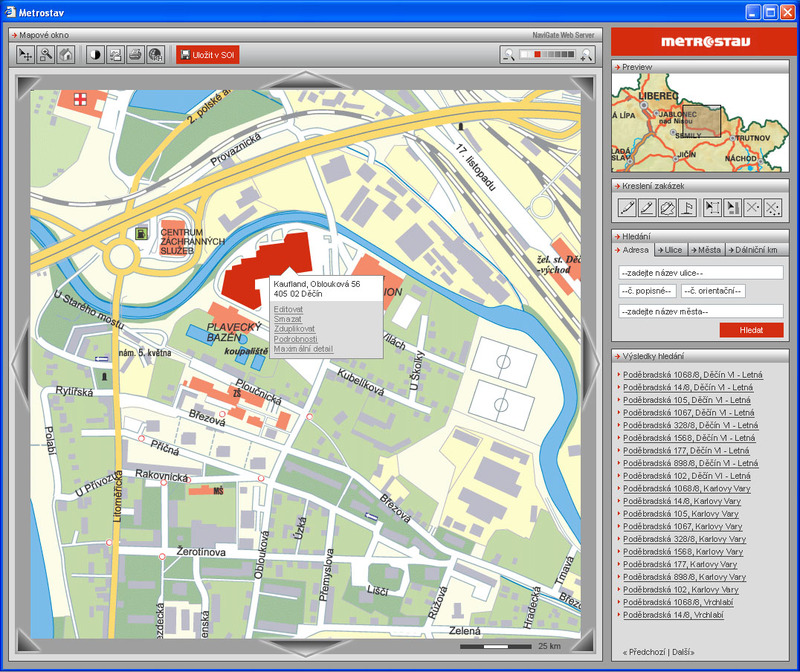 Example of map interface of SOI application.